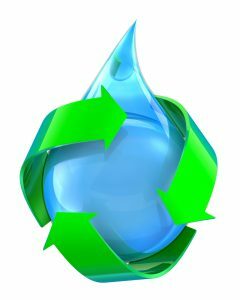 The Fountain Hills Sanitary District is a governmental entity (special taxing district) with the sole purpose to collect, treat, and dispose of wastewater and its by-products. The District’s service boundaries include the Town of Fountain Hills (except the former State Trust Land annexed by the Town in 2006) and a very small portion of the City of Scottsdale. The area served is approximately 12,000 acres. The District was formed on July 21, 1969, in accordance with Arizona Revised Statutes Title 36. The District was authorized via elections on March 30, 1971, and June 12, 1973, to sell bonds totaling $20,910,000 necessary to finance the construction and expansion of most of the District’s pumping and treatment facilities. The entire authorization was sold by 1995 and paid off by 2005. To this day, the District remains debt-free. The original wastewater treatment plant (WWTP) was located on a seven-acre site west of the confluence of Ashbrook and Balboa Washes. The site did not extend all the way to Saguaro Blvd. leaving approximately four acres between the plant site and Saguaro Blvd. The first phase of the WWTP was completed in 1974 with an initial capacity of 0.3 million gallons per day (MGD). Homes were served by either individual or community septic tank and leach field systems until wastewater collection lines and pump stations were constructed to convey sewage to the WWTP for treatment. 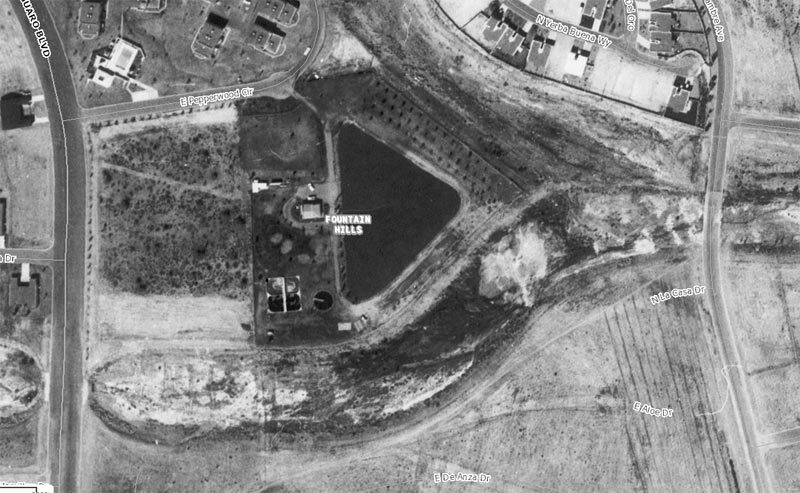 In 1980, the District acquired the four acres of land adjacent to Saguaro Blvd. in order to expand treatment facilities needed to serve the growing population. The District’s WWTP was improved or expanded by various projects over the years. 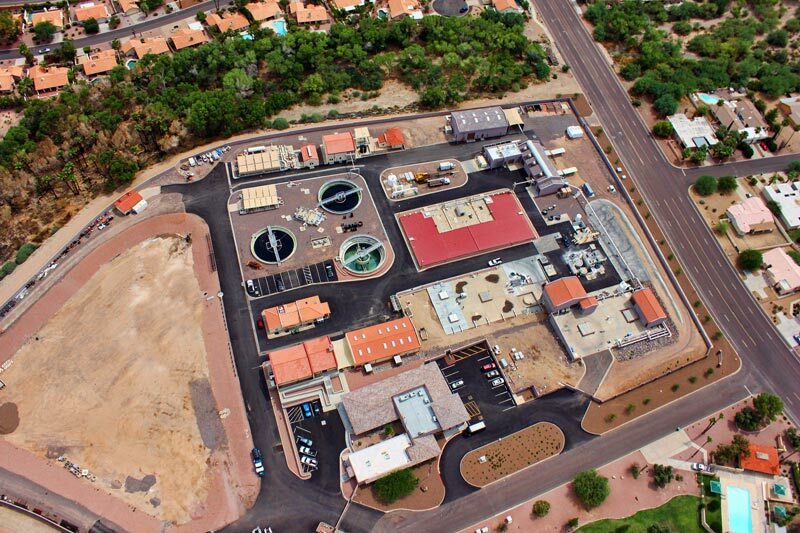 Today, the facility is rated to treat up to 2.9 MGD of raw wastewater, converting it to Class A+ recycled water, the highest designation allowed by the State of Arizona. The effluent, or recycled water, produced by the District’s WWTP was and continues to be used to fill Fountain Lake. However, by the early 1980’s, recycled water production exceeded its use in the lake. Consequently, from fall through spring, vacant land on the south and west sides of the community were over-seeded with desert grasses and the areas were irrigated with the excess recycled water. As the population increased, additional recycled water was produced, and additional acreage had to be over-seeded and irrigated with the excess effluent. By the mid-1990’s, land used for temporary turf irrigation was being removed from service and developed as housing subdivisions. The District found itself having to figure out what to do with its growing water excess in the winter and its shrinking available land. After examining the options, it was decided to construct multiple aquifer storage and recovery (ASR) wells, which allowed the District to seasonally store water in the ground during the winter for use by the golf courses and parks in the summer when the recycled water demand exceeded the supply from the WWTP. In order to safely store water below ground and not impact the local groundwater aquifer, the District first constructed the Advanced Water Treatment Facility (AWTF) to provide further treatment of the water before recharge and storage. These facilities began operation in February of 2001. 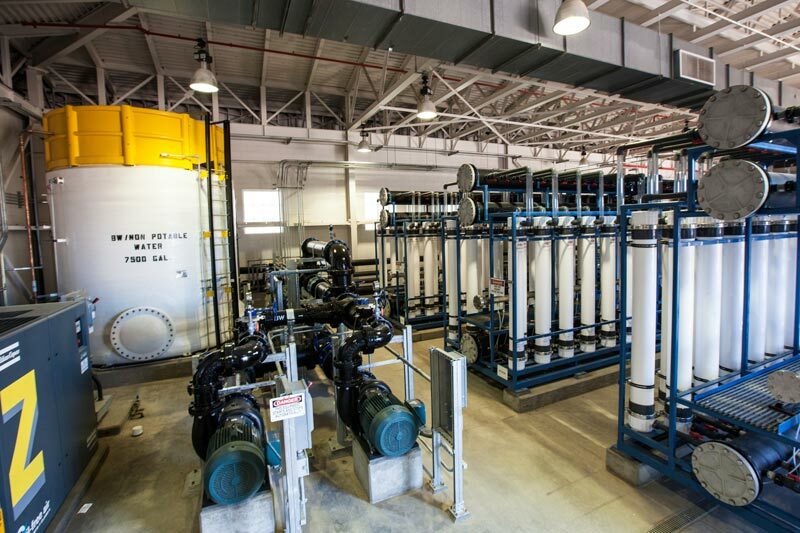 Today, the District operates a sophisticated system including ultra-filtration membranes, ultraviolet (UV) light disinfection, and five ASR wells to successfully manage the seasonal supply and demand of recycled water. All wastewater in town, is highly treated and beneficially reused for irrigation purposes. The Sanitary District prides itself on being good stewards of the environment and doing its part to protect the desert’s limited water resources. The Sanitary District has been successfully Recycling Every Drop since 1974.